This question came up on my Facebook feed and there was some lively discussion around the question. I added a comment and was taken to task for it so I thought I'd post the conversation here. It will most likely ruffle feathers and that is ok, all I'm after is thoughtful, respectful ideas. Sorry, Kylie, but this is completely against Christian and certainly Salvationist theology. Jesus said "I am the way, the truth and the life. No man comes to the Father except through me." There is but one way to Heaven and that is through faith in Jesus Christ. Do you really think that if "as long as you live with love" was an option for getting into Heaven, that God would have asked His one and only son to endure what He did, as a sacrifice for you? For me? I think that our entry to heaven is in accordance with our understanding. I also know that the Holy Spirit speaks to people who have no, or different understanding of God. Or who know God but don't name Him as such. Jesus was sacrificed for us but do we need to know his name in order to benefit from his sacrifice? What if a person who doesn't know anything about God in the formalised way we have been taught, hears the Spirit, responds to the Spirit and continues to do that for their lifetime. Is that person excluded from God's presence for all eternity? You both believe in heaven, but you didn't mention hell. 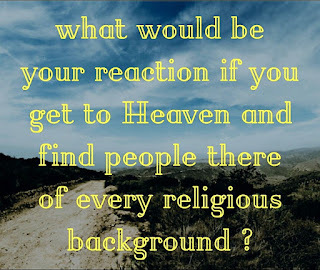 OTHER PERSON's belief was what I grew up with, only we didn't believe that anyone who wasn't a member of our small denomination could go to to heaven (meaning that all of them would go to hell), and we used the same argument that OTHER PERSON used, i.e. Jesus only died so that people who belong to HIS ONE TRUE CHURCH could go to heaven, and that anyone who sincerely sought God would be led to HIS ONE TRUE CHURCH , by which we meant our church. It didn't matter if a person lived in some place where the gospel was never preached, or in which our church had never been heard of, we believed that if that person sought Christ sincerely, Christ would lead him or her to us. The fact that nearly all of our membership lived in the Southeastern U.S. didn't phase. The fact that no record of our church could even be found before the mid 19th century didn't phase us, because when you have faith, it doesn't matter to you that your beliefs fly in the face of known reality. Like my childhood church, OTHER PERSON has zero respect for other religions, and would probably be fine with destroying their art and their places of worship, but I don't know how she feels about people in churches other than her own, it being very common for Protestants to believe that Catholics, Eastern Orthodox, and various other churches to be impure and therefore doomed to hell, and it's common for people in the condemned churches to feel that same about people who condemn them. Love doesn't mean crap to people like OTHER PERSON, Christ's message not being about love to them but about purity, about getting doctrine right, which was the very thing that Christ condemned the Pharisees for. OTHER PERSON feels superior as she looks about her at the millions of people who don't accept her beliefs because, after all, God is going to take her to live with Him while condemning nearly everyone else who ever lived to hell. More thoughts. I can see your point, Kylie, but as far as my understanding of the Bible goes, OTHER PERSON also has a point. While you're trying to reconcile your belief that a God of Love wouldn't deny heaven to people who are doing the best they can in life, OTHER PERSON is pointing to texts that very much seem to suggest that if you don't believe that Jesus is God's son and your savior, then you're cooked. You probably have the Unitarian Universalist Church down there. It is the result of a combination of two churches, the Universalist half of which believed that EVERYONE goes to heaven. After all, if Christ died for the sins of the world, does it make sense that the a person could nullify his sacrifice by not believing in him? By way of comparison, let's say that you're convicted of a crime and fined $10,000, and I come along and pay your fine, what you think or say about my action wouldn't matter to the court because your fine would have been paid. I once took a semester long class that was entirely devoted to the different beliefs that people hold about the atonement, and while such things interest me, it also seems bizarre to me that people can take an ancient book that was written by unknown authors and that contains horribly contradictory beliefs about the nature and character of God, and use that book to say that, if you don't believe as I do, then God is either going to deny you a place in heaven, sentence you to everlasting agony in hell, or both. I mean, come on! We're talking eternity here, and we're talking about a really screwed-up species that is no better and no worse that what God himself made us to be. Even his first two people who lived in paradise and walked with him in the Garden of Eden "in the cool of the day," sinned the very time they were tempted to sin. THAT is our origin as a species, so does it really make sense that God would say, "Well, you people have failed me miserably, but I'll tell you what I'll do. I'll send my "only begotten son" to die as a blood sacrifice to myself so that I can forgive you. But wait, even then I won't forgive you unless you believe certain illogical things that there is no evidence for." Way back all those years ago when I realized what the true of my religion was, even then I tried to hold onto it, to make sense of it, and that is why I took that course in college along with a number of other courses. I thought that if I could pray enough and learn enough, I could hang onto my faith. But I couldn't, and I truly don't know how anyone can. I can understand why they would want to, but how they actually do it, I have no idea. None. The Christian faith is to me like Alice going down the rabbit hole in that the nature of reality is completely abandoned, only in the Christian faith, what is left is called a divine mystery, or a divine reality, or ultimate reality, but why should anyone believe all this? THAT, no one has ever been able to explain to me in a way that I could understand it, and it's not that I don't want to understand or that I haven't made a very great effort to understand. What I see in you that is vastly superior to what I see in OTHER PERSON is that your bottomline is that God has to be good according to the human conception of goodness, whereas OTHER PERSON takes the position that God can do any horrible and unfair thing that God pleases and OTHER PERSON will call it good simply because if God does it. If OTHER PERSON got it into his or her head that God wanted Christians to torture and kill "heretics," then OTHER PERSON would applaud the torture and killing of heretics. I say this because history is full of Christians doing just that. You wouldn't do it though because you hold God to a higher standard than people like OTHER PERSON. Wow, you sure have a lively comment stream here! I'll eventually give you some replies! I'm a bit flat chat with other things! "Christ's message not being about love to them but about purity, about getting doctrine right, which was the very thing that Christ condemned the Pharisees for." You express that really well. I have never quite managed to put my finger on that attitude and you have got it on the knocker. Your arguments make sense to me. Interestingly, this person went on to say that they feared my belief that people can get to heaven without acknowledging Jesus would make me complacent and not make any effort towards their eternal salvation. Maybe it was doctrine in the guise of concern, I don't know. It's interesting that they say they are concerned and you see them as completely disrespectful. Maybe it's possible that you are both right? "it also seems bizarre to me that people can take an ancient book that was written by unknown authors and that contains horribly contradictory beliefs about the nature and character of God, and use that book to say that, if you don't believe as I do, then God is either going to deny you a place in heaven, sentence you to everlasting agony in hell, or both. I mean, come on! We're talking eternity here"
"What I see in you that is vastly superior to what I see in OTHER PERSON is that your bottomline is that God has to be good according to the human conception of goodness, whereas OTHER PERSON takes the position that God can do any horrible and unfair thing that God pleases and OTHER PERSON will call it good simply because if God does it. " If I believe that the human concept of goodness is modelled on or reflective of God's goodness (and it has to be) then I also must believe that God is conforms to the idea of goodness that He has given to us. I do understand that morality is subject to education and cultural values etc but ethics are a more universal kind of concept and I think that a "good" person is recognisable in any culture and according to any religion. I"m a bit tired and I could be going in circles but if God is the source of all goodness, the designer and creator of everything good, pure, beautiful and noble the God must conform to those ideals. I understand that my ideas are not conforming to traditional teaching and don't conform to what the bible appears to say, I just can't reconcile a good God with one who doesn't give everyone an equal chance. I would prefer to try to live with a contradiction like that than to accept the idea of my God as completely arbitrary about these things and lets be real, why should an infinite and unknowable God conform to humanity's interpretation of His word? "If I believe that the human concept of goodness is modelled on or reflective of God's goodness (and it has to be) then I also must believe that God is conforms to the idea of goodness that He has given to us." I don't see our goodness in the Biblical deity; I instead see cruelty and hypocrisy in the Biblical deity. First there were the blood sacrifices he demanded, the wars and massacres he ordered, his sentencing people to death because they are gay, his prejudice toward non-Jews and women; and that's just in the OT. In the new, there's the story of him sending his Son (God has a son!) to die as the ultimate blood sacrifice to HIMSELF! I recently came across a school of Christianity called "Progressive Christianity," which, as near as I can determine, throws out the parts of the Bible that portray God in a way that is offensive to compassion, justice, openness, tolerance, and decency, and holds to what is left. I could go to a church that did this, but I would still be unable to believe that a good God presides over such a world as we inhabit, although I very much wish I could. "It's interesting that they say they are concerned and you see them as completely disrespectful." I know. It's the old "hate the sin but love the sinner" claim with the emphasis being on the hatre. At the same time, Christ himself heaped contempt upon those who didn't accept him, and Christ himself certainly seemed to say that the only way to get to heaven was through belief in him. But then how do we even know WHAT he said? I think that religious faith must be seen from the inside to be understood because if it could be understood from the outside, then I would understand it, and maybe even figure out a way to make it work for me so I wouldn't be perpetually tortured by wanting to believe that an ultimate purpose exists and that I won't lose the things that I love when I die, yet no being able to do so. In my thoughts about Trump, I wonder if people's faith in him doesn't come from the same mindset that religion comes from because people like Marion continue to believe that he is good despite him being so overwhelming and demonstrably false and in all ways bad. For example, I've started (on my blog) comparing him and his followers to Nazis now that he and they are referring to desperate people invading our borders in terms that are reserved for rodents and diseases, which is exactly how Hitler referred to non-Aryans. Because I can't come up with a way to believe that decent people can talk like that, I'm rapidly losing the ability to distinguish between these modern Americans and those early twentieth century Nazis. I wish I didn't think about all this so much, but I figure that maybe I'll eventually find some way to come to peace with it all. At least that's my hope. "I understand that my ideas are not conforming to traditional teaching and don't conform to what the bible appears to say, I just can't reconcile a good God with one who doesn't give everyone an equal chance." As you know, I grew up in an ultra conservative political and religious environment, and when I reached my twenties and discovered a whole world of liberal thought (and, yes, doubt), I thought that I hadn't previously encountered, I thought it was all new. Thankfully, I discovered that liberalism in both politics and in religion have ancient roots, and my love affair with the writer Margaret Deland represented a further advancement in that direction because in her novel "John Ward Preacher," and in her second autobiography, I found in the words of this 19th century woman my own story. Forgive me if I seem patronizing by saying things that surely seem obvious but are nonetheless easy to forget. Your faith isn't a place but a journey, and the fact that you recognize that you don't have many of the important answers is surely a good thing if only because it will keep you from looking down on others as well as from committing excesses of thought if not of action. You are my main link to religion as a virtue, and this isn't because you have the answers but because of how well you treat me. I see in you a genuinely good person who is doing her best to use religion as a vehicle for good in her life and in the lives of others. I just hope that you will never imagine that you have some responsibility for presenting me with something called "sound doctrine" as opposed to presenting yourself as an evolving person because, believe me, the former will never work, no matter how subtle, how loving, or however well-intentioned. More often than not, I surely make it hard for you, but I never mean to attack you as a person, and behind my attacks is a very great desire to discover that, despite all my doubts, the universe really is a good place and that all of these horrible things that happen here on earth have some transcendent purpose. Most religious people, it seems to me, abandon intellectual integrity. I find it odd that, if believers see it in me, they never think it prudent to say it, and what I refer to is that if religion can be thought of as a wrestling with God in the same way that Jacob wrestled with God (meaning down in dirt for an entire night), then I am a very religious person given the direction of my thoughts. I well remember reading something by Isaac Singer, and being astounded by how much more deeply and honestly the Jews in his books talked about--and questioned--God than had any Christians I had ever known, it seeming to me that most Christians are scared to death of God. While they claim to have faith in his love, they act as if they're afraid they'll piss him off, either that or they really do regard themselves as possessing all of the important truths, and that there is therefore nothing left to be done but to fill in around the edges. Snow, I have always regarded you as wrestling with God and you are right, I didn't think it right to say so. You are the right person to identify yourself, it's not my place. Saying such a thing has a religious arrogance to it, as though I have to bring your belief as close as possible to mine, as though it is not possible for a person to come to the conclusion of atheism but must fit some kind of Christian box. Certainly in my experience, questioning of faith could be seen as failure by many and i have reminded friends that their faith is meaningless if it hasn't been examined. The Jewish people are much better at questioning and wrestling, indeed it is an essential part of their identity. Is religion a set of dogmas or is it a search for some vague ultra reality that one can't avoid wanting to exist although he has no reason to think it does? You are right in that it's presumptuous to define a person in ways that he doesn't want to be defined, although if your God is the God of pantheism, then, by your definition, an atheist would be a theist. I think I have a fairly good understanding who God is to you, but what I don't know is how certain you are of the existence of your God. Would you say you're at 95% certainty or would it be 45%? Maybe it's 33% on your bad days, but 90% on your good days? A similar thing is true of atheists. Few atheists would completely deny that something called God might exist, although it would be harder to put a % to "I don't believe it, but I could be wrong" kind of thinking." I can but say that when it comes to the belief in the God of the Bible, I would put my certainty that he doesn't exist at 100%, partly due to some of the objections you've mentioned (like his gross immorality in the Bible). But if God is the sum total of existence, then I believe in God, although I don't see what good it would do me to use the word. I'm an animist at heart, meaning that I see consciousness everywhere. I've always felt this way, not because I can give a smidgen of evidence for it being true but because I am unable to believe that it's not true. Because I feel this way, I show greater respect than most people for all of the things of which our universe is composed. I've heard it said that we all have myths that we live by, and perhaps this is my myth. Would I really like to know if it's not true? Yes, I would, and this leads me to ask you: would you want to know if your God is unreal? Peggy's father's preacher's wife had a cancer on her face. Instead of going to a doctor, she was confident that God had put it there in order to heal it through prayer as a sign to his people. So she prayed, and prayed, and prayed, before giving up and going to a doctor. Her nose and jaw had to be removed (she now "eats" through a feeding tube). She no longer goes to church or anyplace else that people can see her. Now, THERE was a woman who put her trust in God, although I don't know how she feels about God now. I suppose some would say that she failed the test, and that if she had persevered, then God really would have healed her. If there is a God, one thing I'm 100% sure of is that that God doesn't answer prayer. Never, ever, have I seen any prayer answered unless the prayer was for something that might reasonably have been expected to happen without prayer. I wonder if Rhymes would be interested in this blog. We could ask him. It is now August 12th and I have just discovered this post and comment thread. Let me put in my two cents worth. Rhymes agrees more with kylie and even at times with Snowbrush than with the hardline view of OTHER PERSON, though I understand where OTHER PERSON is coming from and have been there myself in days gone by. I am like Ralph Waldo Emerson, I contain multitudes. Some days I am an ultra-fundamentalist and other days I am a progressive liberal. I suppose that might make me what St. James calls "a double-minded man, unstable in all his ways; let not that man think he will receive anything from the Lord," but my faith journey has not been like a straight line from here to there, it is more like a beach ball with wonderful colors that you can't see all at one time, that you can grasp only a part of at a time, like the blind men and the elephant. If that makes sense, which it probably doesn't. Here's the thing. I do believe Jesus was saying the truth when his words are quoted by John in chapter 14, "I am the way, the truth, and the life; no man comes to the Father but by me" but notice that the quote is not about placing one's faith in Jesus. It doesn't say "no man comes to the Father but by PLACING YOUR FAITH IN me", that is adding to the scriptures *which John called a definite no-no in Revelation) and projecting what we may have been taught onto the passage, making it say something it plainly does not. What I'm trying to say, and saying very badly, is my belief is that however a person gets to the Father, it will have been by Jesus even if the person doesn't think it was by Jesus or rejects the idea altogether. If he gets there, Jesus was the road, the way. You reach Miami by going south on I-95 and you reach San Diego by going south on I-5, but if you wind up in Miami you will not have been on I-5, you will have been on I-95 the whole time even if you thought you were not. I'm sure I'm only convincing both of you of my advanced senility, and perhaps you are right. Then again, perhaps you are not. When all is said and done, kylie's way of love is closer to the mark, in my opinion, than OTHER PERSON's loveless, dogmatic approach. "Some days I am an ultra-fundamentalist and other days I am a progressive liberal." I too feel differently in different days, but I'm sad to report that I've found the churches to be more destructive than supportive, although I must admit that I haven't always made it easy for them, a thought which takes me back to the words of the prayer..."that I may seek to understand rather than to be understood." "I suppose that might make me what St. James calls 'a double-minded man, unstable in all his ways; let not that man think he will receive anything from the Lord,...'"
I hadn't thought about this verse in years, and now that I do, it enrages me, not because some moron said it, but because it found a place in what is supposed to be Holy Writ. I regard it as the hateful and dismissive position of a rigid man who is devoid of compassion for anyone who struggles and, as a result of those struggles, thinks differently today than yesterday. These are the words of one who feels ever entitled to speak on God's behalf and to threaten those who disagree or vacillate with a God-created hell, yet St. James got up-close and personal with Jesus and the other apostles, and while I don't recall whether he performed miracles, he certainly saw them performed. Compared to THAT, what did the people he was writing to have, and what do we have? What if we had seen Jesus walking on water or feeding thousands out of a few loaves and fishes? On the one hand, Jesus condemned those who demanded miracles, but on the other hand, he and the apostles performed them freely "that you may believe." (I think I got the circumstances of the quotation correct.) Rhymes, if it didn't make you feel a little crazy trying to make sense of the Bible, I don't see how you could be the fair, honest, and compassionate person who I know and love. I referred to that biography of Bishop Pike. How that man struggled. He was incredibly flawed and hurtful, but how I wish I had known this man who was also in such deadly earnest and so unafraid to change. Counting this one, you're up to 13 comments, Kylie. I'm certainly impressed. "Rhymes agrees more with kylie and even at times with Snowbrush..."
"Even at times"? Does this mean that you're greatly astounded to observe that you agree with me "at times"? Does this mean that you regard me as having a poor track record of valid observations? In the words of All Consuming, "Ha, ha, ha, ha ha!" Another thought, Rhymes...I think you and I should both start referring to ourselves in the third person around our wives and, after a week or so, check back in about it went. Kylie, you could be part of the experiment too, you know. "check back in about it went." I left out the word "how" because I couldn't decide where to put it (no snide remarks, please). I like your beach ball analogy. Faith is a slippery thing to explain or describe, isn't it? Some of my opinions on these kinds of matters are just that: opinions based on what I know of God, not really informed by any specific study or understanding of the Bible. Having said that, my understanding of God, which informs my opinions, has some biblical basis. I've often been tripped up an the "I am the way...." verse and have wondered how to reconcile it with a world full of people who have not been introduced to God or maybe know Him by another name. Your point about what it actually says and what we assume it to say is a very good one and clears up a lot of uncertainty. How does Peggy like you referring to yourself in the third person? There's an old proverb: Good things come to those who wait. I just knew you would get around to commenting again on this post eventually, and my hopes were not misplaced. Thank you for proving me right! My mum uses that saying often! I came round hoping you had something new up, although your latest post on your other blog could qualify for this blog as well. Thanks for supporting this blog, Snow! "Thanks for supporting this blog, Snow!" You're welcome, but is your insistence that I tithe to it really Biblical? Surely you know that I wouldn't complain about the money I've been sending if it were all my money, but half of the money I've been sending belongs to Peggy, and Peggy says that it's not only not Biblical, it wouldn't matter if it were Biblical since we're both atheists. That woman can think circles around me. You know that God blesses those who give, right? and the more you give, the more you will be blessed, right? and tithing is pretty much the base rate of giving? ......the sky is really the limit but brother, you can't be mean! Peggy may be able to think circles around you but giving isn't a thinking thing, t's a heart thing! You have a heart big as old Texan, doncha?